" What good is having a story to tell and nobody to tell it too ? ", Are you a Author that self published and book sell are not looking good at all ? Well you need to try our Prison Catalog . 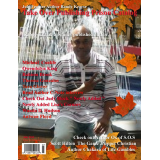 We supply over 40 states with our catalog free of cost to the (inmates) They will enjoy your novels and greeting cards ect....................... for more information go to our website.